Best daily wisdoms of inspiration & motivation that will provide essential boost to the spirit of your beloved children. Sometimes your kids have spiritual problem due to many reasons: they are tired of studying, they feel weak and pessimistic… That is when this app comes and does its job effectively. With 500+ motivational quotes, you don’t have to remember what to tell your kids when they are negative. All these quotes are just right there with just a touch. 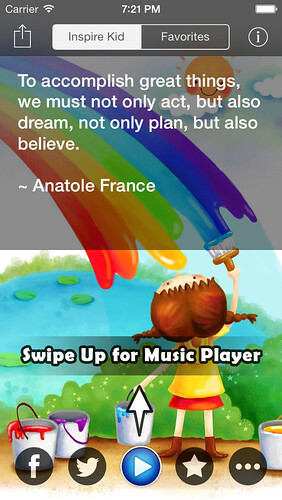 Combining the quotes with the best chosen songs, your kids will just leave the negative thoughts behind, and get ready to conquer themselves effectively as the way it should be. ● 500+ motivational & inspirational quotes. ● 28 great inspiring & relaxing songs with a nice music player. – The first 6 songs are very relaxing, and suitable for making your kids sleep tight. The remaining songs are ebullient and exciting, which are very useful when your kids need some lift-me-up spirit. – When you unlock the music player, you will have all the music features, including making a playlist, so that you can prevent the music player from changing from relaxing songs to exciting songs.